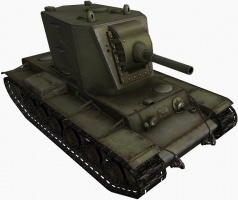 The KV-2 is a Soviet tier 6 heavy tank. 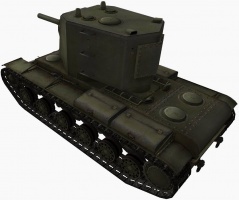 Combining exceptional firepower with a relatively cumbersome, poorly-armored, and slow platform, the KV-2 is one of the most unique tanks in the game. With its 152 mm howitzer, it is a dangerous opponent again anything it is likely to face, dealing heavy damage or crippling modules of even heavily armored tanks using its powerful high explosive rounds. However, it is itself quite vulnerable to most guns it is likely to face, and has its own weaknesses to balance. The KV-2 leads to the T-150, and the S-51. 152mm HE can one-shot, do massive damage, cripple multiple modules and damage through any armour. Near misses damage too. Decent frontal armor and side armor, the turret may bounce some shots. Works well in a KV-2 Platoon covering each other. Useful against any tier enemies - Lower can be 1-shotted, higher ones crippled. Sniping works as hitting enemies is enough. Fear factor: Few enemies want to be first around a corner if they know a locked and loaded KV-2 is waiting for them! Long reload and aim time, slow shell velocity on 152mm - Enemies often try to swarm you after you fire. Slow turret and hull traverse and very tall silhouette makes it easy to get spotted and outmaneuvered. 152mm HE damage is rather inconsistent - you can do anything from 100-1000 damage. The KV-2 is still the undisputed king of "derp", and remains among the most fun tanks to play in the game. In the hands of a skilled player, it's a vehicle to be feared by all tiers that come across it. It can be a difficult tank to take advantage of to the new players. 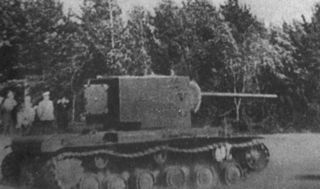 It has a very tall profile, a huge turret and the hull and armor rating of the KV-1, which makes bouncing shots from many other tanks difficult to say the least. However, clever use of side scraping and angling of the square turret when not taking shots can enhance the armor enough to bounce the odd shell. Some players may want to use the 107mm which has consistent penetration, decent alpha and a good rate of fire. However, it seems wasted on this tank when the T-150 can mount the same gun and has much better armor. Which brings us onto the excellent 152mm, and the reason why people go out of their way to research and purchase this tank. It has the highest alpha damage (except artillery) of its tier. In fact, it has similar damage to many artillery of the same tier, but with much better accuracy and aim time. However the penetration is weedy with the AP shells (110/136), meaning you'll have to aim for weak spots and be reasonably close to punch through enemy tanks. This makes the use of HE a good option, as just hitting a tank will cause considerable damage even if the shot does not penetrate. A non penetrating shot yields on average a 330 roll, but this is massively inconsistent and depends hugely on the thickness of armor at the point of impact, the mantle of the T29 for example, will probably only do around 80hp. With 86mm of penetration for the HE, going through the sides and rears of enemy tanks is pretty easy. Try to avoid spaced armor and tracks if you want to guarantee the full 910HP average damage, a good hit will remove more than half of the hit points kill crew and damage multiple modules of any tank if it doesn't just out right kill them. 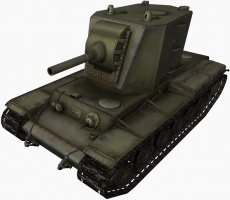 Interestingly enough, using HE in the 152mm turns the KV-2 into a great tank for just hurling shells downrange where enemies commonly peek out, and often, this means that in a way the KV-2 can transform itself into an arty with just a change of ammunition type, if top tier when doing this, do not be surprised if you actually manage to blindly one-shot an opponent in this manner. Once you've fired find some cover as you wait roughly 20 seconds for your gun to reload. You'll be largely vulnerable at this point and the enemy knows this, so use your teammates to cover for you while you reload. The long reload is annoying, but worth it. It's important to make sure you place your shots well as you may not get another opportunity. Try to avoid getting to close to the enemy as your turret is tall and you may not be able to gain the depression required to hit the softer parts of their tanks. Avoid open ground unless you know its clear, the KV-2 will be easily spotted and due to its size easily hit. It is a city fighter and the view range is poor. Play this tank wisely and you can punch through enemy tanks and help your team to victory. 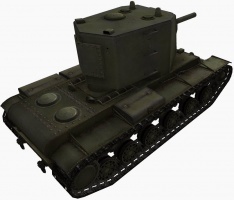 The 10RK radio and V2-K engine are already researched from the KV-1. Research the 152mm first because the stock suspension and turret allow for the cannon to be mounted. After that, get the turret for better view range, hit points and traverse speed. The engine should follow for a boost in power and finally the tracks to ensure your you can turn a little better. 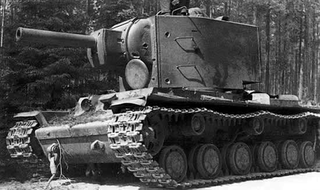 The 122 mm U-11 was never used by the KV-2 as the gun was developed after most were destroyed, captured or phased out. 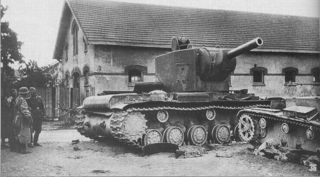 The KV-2 turret was specifically designed to hold the 152mm gun, so putting a smaller gun on it only defeats the purpose.